That includes i7 and i5 desktop systems. Basically there are (3) components. A 3KW inverter, (8) 75AH UPS batteries, 75A PowerMax "power converter/charger"
I use a "cheap" truck stop inverter (Sima 3KW) (I wish I had a true sine wave inverter but I don't need it) for full time power for the equipment. I keep this plugged into the wall and it will keep the power/supply charger and the inverter powered and it's (8) 75AH batteries in good condition. (2) desktop systems (one is a i5 and one is an i7) with (4) 20" LCD monitors, two gig-e ethernet switches, one WIFI access point, a QNAP 16TB NAS, a laptop (or two or three depending), DSL modem, cordless phone and often a lot of Cubie board or Raspberry PI computers. I don't usually have both desktops on at the same time and seldom use the i7 to be honest. 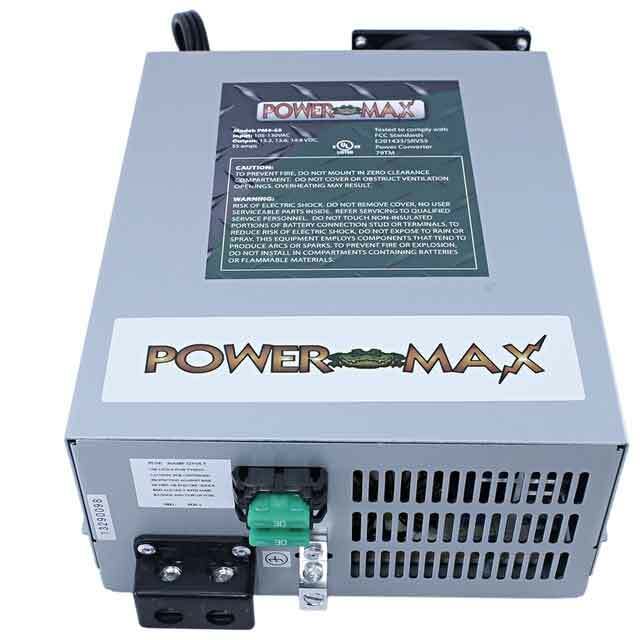 The PowerMax power supply/charger keeps the batteries in the rack charged and also provides the running current for the full-time inverter which can draw quite a lot if the i7 is powered up. In an emergency I can work for over 10-days without generating power as I can simply keep everything powered off except dsl, wifi access point and a laptop. It is not UL approved and I don't recommend this if you live somewhere they will inspect you or tell you how to live. Since I earn my living working on the net, I need to make sure I always have enough power to work. 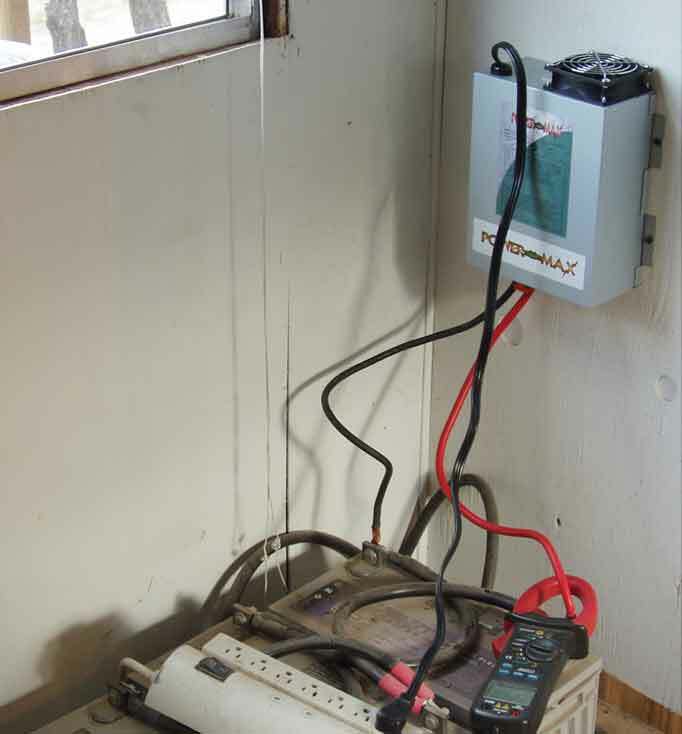 Here is another example of alternative thinking when it comes to "off-grid" power systems. I ordered a PM4-75 12VDC@75A "power converter/charger" for my off-grid power system here recently. 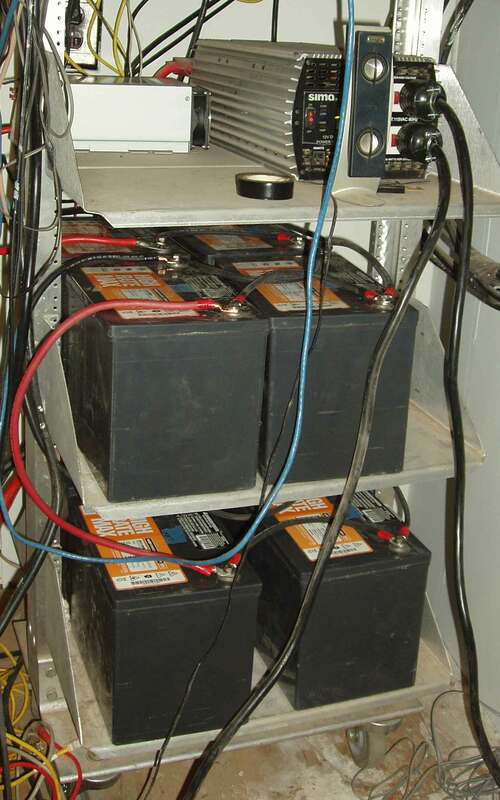 It is the same kind of "power converter" found in an RV/motorhome. I found it on EBAY for $146 with shipping. It is designed to be fed from unreliable and variable AC power from the RV generator or the much better conditioned grid power from (perhaps) an RV park or by an extension cord to a house depending on where you've parked. I've owned some large motorhomes and the built-in generators are not particularly known for producing stable power so this is perfect for me to keep the batteries charged. I attached the PowerMax 75A Converter/Charger to the battery pack today. 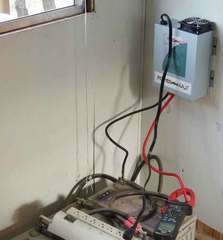 It is basically a 75A 12VDC regulated supply that can charge 12V battery systems. It is connected with 6AWG cables (I made them.) Originally I wanted to use 8AWG but I don't seem to have any around right now. There are (2) 40A fuses to protect everything. The AC cord is a bit short for my needs and I will either replace it with something longer or fabricate a short extension cord so it can reach the wall outlet near where I mounted. It is plugged into a 20A AC circuit. At full draw it's using 12A (AC) maximum so it's wall socket (and generator) friendly. While I have enough alternate energy sources to keep going in almost any situation, I also paid for commercial power install about a decade ago. I treat the grid as a backup source (i.e. generator) and use it when needed. ETA 2916-10-10 I want to recommend Power Max in the highest possible terms because they stand behind their warranty. I have (3) of these units now and they are extremely reliable in most cases. I believe they make great bench power supplies, useful for bulk charging lead-cell batteries (not gel cells however, as equalization cycles are bad for those, heh.) I have been using their power supplies/chargers for quite awhile now.